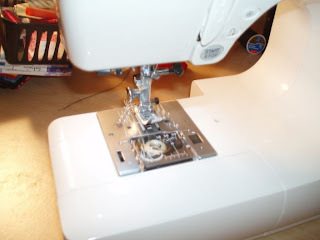 When I bought my Janome, I was so excited I started using it right away. BUT the thread tension was weird. It didn't show up right at all. In fact I have to keep my tension for the upper part of my machine at close to 0! I didn't want to complain about it because it's suppose to be a better machine than my brother and I thought eventually it will somehow fix itself. I'm sure there are other things you can do that I didn't think of or knew but these were the things that usually "fixed" my brother. Well it worked when I had it set to 0 so I just lived with it. Now after looking at the Hello Kitty comments it seems that people that bought the Hello Kitty sewing machine also had a thread problem! And it's a Janome too! So here is my plate and I'm suppose to take it off. So you're suppose to take the bobbin out with the bobbin holder. This is my naked sewing machine! It was kind of dusty so I blew it out with my compressed air (that stuff you use to clean keyboards). So here is my bobbin with it's bobbin holder. Anyways in the comments (for the hello kitty sewing machine) it said to pull at the thread while it's in the bobbin hold. So it's suppose to have a nice tug. Not too loose or too tight. It turns out that mine was really really loose. I had not problem tugging at all. 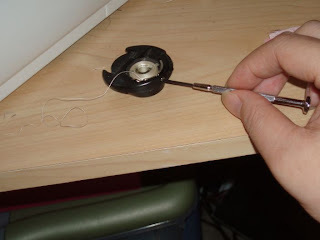 So to fix it all you have to do is take a little screw driver and for me I needed to tighten that screw between where my bobbin thread enters the bobbin holder and where it exits it. BOOM that totally fixed my problem! Now I can have my top tread tension at 4 and have my stitches come out right. Sweet. 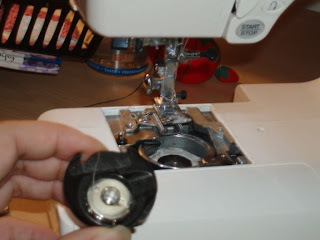 After trying, with no success, to unscrew the plate, I realized that the screw to tighten the bobbin tension was accessible simply by turning the bobbin's casing. Thank you again for saving me a whole lot of frustration!! I'm glad it helped you! ^_^ My blog is good for something. Yay! hehe. Thanks for this. I never noticed that screw before, or would have known what it was for. 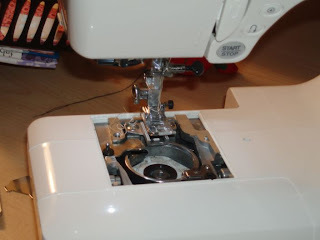 I have my machine perfectly tensioned for nylon thread now and I tried every which way with the knobs before!! Thanks again. PS Recently, I learned that we are not supposed to use compressed air in our machines. The moist condensation can lead to rust. Now I use pipe cleaners & q-tips. THANK YOU SOOO MUCH FOR THIS!!! I found your post at one in the morning, crying my eyes out because I had to get a few items finished for a wedding. I'm not a novice sewer, so the more the machine stuffed up, the more upset I became! I could just see it costing me time and money to fix, time which I did not have! So, thank-you from the bottom of my heart, I am truly truly grateful that you took the time to post this with pictures and everything! Thank you from me too! Having battled for three hours this morning, you saved me from the horror of a potential three days from your other blogger! Best, Catherine, from Scotland. Taking it into the retailer this afternoon. We'll see what happens. I too had a similar problem which the lady in my local quilting shop solved by telling me about that tiny screw on the bobbin holder. Why can't Janome mention this in the instruction manual. I am sure it would save a tremendous amount of time and frustration. I just bought a Janome and have the same problem. I googled and you came up with your awesome explanation. Thank you! I'm going to try it today and see if it helps. If not, I'll have to call the store I purchased it from and see what they say. Thank you so much! I have been searching for a solution to exactly the same issue with my Janome DC3040. It's the first machine I've ever had that doesn't use a bobbin case, so I had no idea how to fix problems with the bobbin thread tension. Thank you so much for this tutorial. I was so frustrated and then I found your blog. You saved the day! Thanks for this tutorial. My new Janome wasn't just sewing how I wanted - tried everything in the manual and was setting thread tension to 0! Thought - this can't be right! Found your post - problem solved!! I have a new Janome 605 and it seems that the bobbin thread is too tight as the reverse of my sewing always looks a bit kind of pinched and I have to have my top tension rather tight. But my boobin case seems to have 2 screws? Any feedback anyone please. I am very reluctant to fiddle with the bobbin screw until I know for sure that it's oK. Thank you! I've been dealing with this issue off and on for months, and somehow never thought to check the thread tension of the bobbin manually. Now my machine is happy, and I am, too! I am a noob when it comes to fixing my machine and this worked a treat! Nice and simple instructions. OH MY GOSH -- I'M SPEECHLESS!! I have been fighting this problem for forever! THANK YOU SO MUCH. Finding your blog was a God moment. I just bought a used Janome 6500 off a seller on Ebay and it had the same problem. I had tried everything, or so I thought. I was ready to send the machine back to the seller, but along came your blog. Thank you, thank you, thank you. One.little.screw. So.much.power. The machine sews perfectly now. My quilts are waiting. I have to go, but, again, thank you. 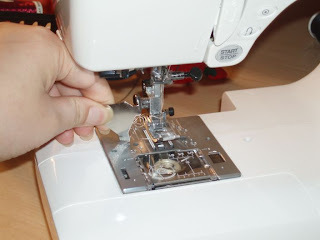 Thank you for posting this blog it was very useful, it fixed the problem my wife was having with her Janome200e, please continue your great posts. Thank you so much, this worked perfectly for my problem with my Janine sewing machine. You are my hero. OMG! I feel like hugging you right now! You just saved me a day of work, 45 british pounds, a nervous breakdown, and a 30 minute walk up-hill with my sewing machine in a suitcase to get it to the repair store (I don't have a car...and live in the most hilly city every created...). PLUS, it is actually really satisfying to get your hands on the sewing machine, and fix the problem. I felt like McGyver for 10 minutes. I agree with Mary and others, you are a hero. Hallelujah. Thank you for your really helpful info and photos. 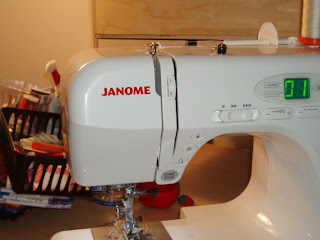 As a long term sewer I was beginning to despair with my new Janome as I just couldn't get the tension right. Which little screw is it? Straight or phillips head? How much should I turn it? Sooooooo over the mess of threads on the underside of my fabric!!! Thank you! Just have to add one thing. 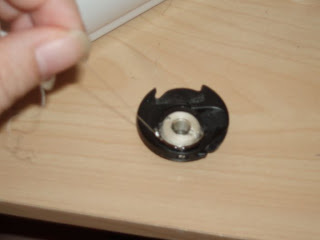 I took my bobbin assembly apart as described and brushed away all the fluff in the well and on the black thing, and then I tried tightening the screw, but the tension was still way too loose. I tried tightening it a bit, kind of a lot, and super tight, without result. Then I loosened the screw all the way and blew in between the two curved bits of metal (I guess the thin one is the equivalent of a tension disc?) and eventually I pulled out a *tiny* knot of dust from behind where the thread runs. After that it was possible to tighten it and the machine now runs perfectly! Thank you for this post! Thank you!!! I got a very expensive new Elna 860 (same as Janome 9900), no local dealer. Have thought I was going crazy. Everytime I tried to sew on my fancy new machine the bobbin tension was all loose and on straight stiches, I could just pull it out. Followed your instructions and YEA!!!! IT WORKS GREAT NOW. Thanks for thinking your post would help someone - it saved the day!After hours of trying to figure out what was wrong I found your blog, tried your solution, and am now able to finish the job. Thank you! thank you for your idea I am going to try it and see if that is my tension truble .thank Vivienne from Australia . Brilliant - why does the manual not tell you this. After months of endless re-rethreading, no loops on the back! This is the best! I was at the dealer and asked a question about if it was possible my thread tension was messed up and they told me I had the wrong thread for the bobbin. No fix. I had some opinionated older ladies tell me that I didn't know what I was doing. Not helpful. I played with upper tension settings and tore my hair out over broken threads and terrible stitches for quite some time but I've finally solved my issues! My Janome embroidery machine is finally working great! Thank you so much - that last picture is worth its weight in gold. Oh, my God!! You have saved me a trip to the shop! Thanks very much!!!! Thanks a million for this blog and your pictures. You have saved me from taking my machine into the shop. 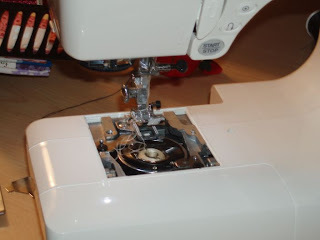 I have been trying to get the tension problem resolved on my Janome Harmony 8080 for months. Seriously, I am so very grateful. Thank you for sharing such a helpful hint. Thank you so very much!! My tension is mostly fine for what I sew but I’m making a Christening gown out of very fine material for my first grandchild and the tension was horrible, puckering something shocking. Thanks to you it’s now perfect and I can get started fully confident that it will be gorgeous. Hi all! I have read over all the comments. I was bought a new 7900 and I have had nothing but trouble and believed it to be me. Same thing, tried everything multiple times. Was at a Janome days lesson the other day and they suggested buying the blue dot bobbin. Thought that might fix it. Didn’t. Is this worth trying on the original bobbin? Been told not to mess with the blue dot bobbin as it will never go back if you touch it. I’m going nuts and have reverted back to myElna in my frustration. Thanks for your help. Sometimes bad tension is the result of a heavy thread or a different needle. I just discovered that thread has different thickness and can really mess up my tension. Also, the newer batik fabrics (gorgeous as they are) are a tight weave and difficult to get a good tension with. So frustrating. They also say that thread produces lint that can mess up our tension wheels inside the machine and we should vacuum, with a a TINY vacuum, out the threads inside the machine. Really!?! When did our machine get so complicated? Ugh.